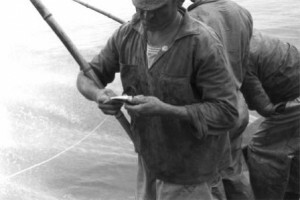 Some methods of fish capture use live fish as bait. This is likely to cause of considerable suffering over and above that caused to the fish caught for food. 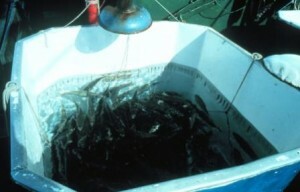 Tank holding live bait on a tuna boat. These bait fish will have suffered fear and distress caused by capture and confinement, possibly for days or weeks, before they are impaled on hooks or scattered live amongst shoals of tuna. Death rates of bait fish held in tanks for pole-and-line fishing can be high before baiting even starts. Fatal shock and injury can be caused by handling and crowding. Fish are likely to be frightened further when dropped into the open sea, an unfamiliar environment to those originally caught in shallow water or reefs, in the practice of “chumming” (see Pole-and-line fishing). Baiting a hook with a live fish. Live fish that are impaled on hooks as bait, as is common in long line fishing, will then suffer pain and distress from tissue damage. They are likely to suffer fear from being immobilised and unable to escape predators. The suffering caused during fish capture could clearly be greatly reduced by avoidance of the use of live bait, preferably using artificial baits or fish off cuts instead.